This enormous copper Buddha statue - nearly as high as a 10 story building - serenely sits on a mountain top overlooking the land and sea far below. Choose a reasonably clear day for your visit. Otherwise, clouds might obscure the panoramic vista below and the head of Buddha above. The statue took 10 years to build and was completed in 1993. Some travel books call the figure "the world's tallest seated outdoor Buddha statue". That would be true if you insert the word "copper" (the seated Leshan Buddha stone statue in Sichuan province is almost three times as high). 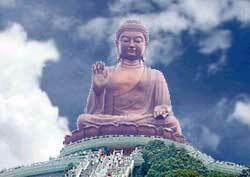 The Tian Tan Buddha is sometimes called the "Po Lin Buddha" because it is part of the Po Lin Monastery.